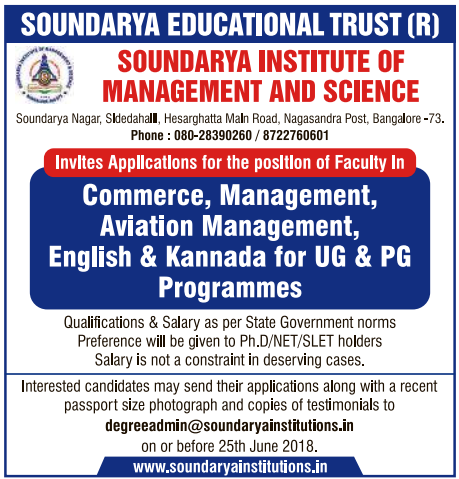 Soundarya Institute of Management and Science, Bangalore has advertised in DECCAN HERALD newspaper for the recruitment of Teaching Faculty- Professor / Associate Professor / Assistant Professor jobs vacancies. Interested and eligible job aspirants are requested to apply on or before 25th June 2018. Check out further more details below. About College: Soundarya institute of Management and Science is a prestigious institute as a part of Soundarya Educational Trust, has come a long way since its modest beginning in 2007. It is established by the great visionary Shri. Soundarya P Manjappa, a founder chairman of SET. SIMS is committed to developing the students with positive attitude, behaviour, values, skills and competencies expected from global service providers. Reference: Advertisement from Soundarya Institute of Management and Science, Bangalore on DECCAN HERALD newspaper dated 20th June 2018 for the recruitment of vacancy position such as Professor / Associate Professor / Assistant Professor faculty jobs. See the copy of advt below.